I’ve been running the company-wide hack at Hooroo for the last year or so and I thought I’d share how they happen. There isn’t a lot of great info on the web on the topic of running Hack Days and where there is, everyone is doing things slightly differently. I’ll let this serve as a contribution to that pile of disparate info for others use how they please. It’s also my last day at Hooroo tomorrow so this serves as a guide for those who’re carrying the Hooroo Hack torch into the future! The big takeaway is that the key to a great hack day is the prep that gets put in leading up to the event. If the prep happens then the participants, theme, location etc all fall in to place. 1) Pick a date. This is the first and most important step. We try get 6-8 weeks ahead of ourselves with this. Get an all-day 2 day invite sent out and into everyone’s calendars so there’s few excuses for not being there. This also buys 6-8 weeks to prep which allows for a nice relaxed build up. 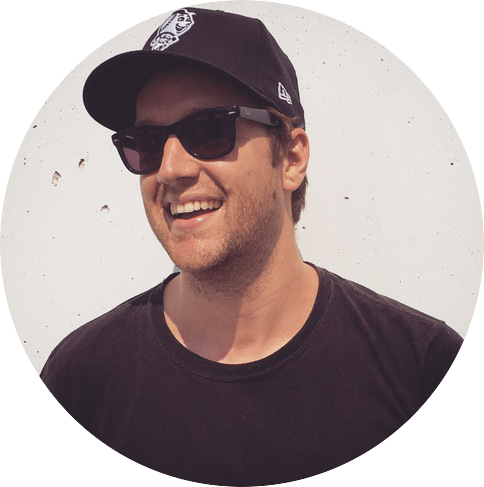 Pitch anything that helps Hooroo customers, helps raise awareness of the Hooroo brand, or helps Hooroo suppliers. Pitch something our competitors are not doing. Pitch something that makes coming to work at Hooroo more awesome. A good theme is one that folks can get their heads around pretty quickly, is relatively broad in terms of scope and creates a lot of discussion (usually about how good or bad of a theme it is). The idea of having no theme for the next hack has been discussed a lot – it’s always something worth considering and no doubt you’ll get feedback on whether it’s a good idea or not. 3) Create teams. Because Hooroo is only a small crew (30 employees), pre-determined hack teams with a even mix of members from the various Hooroo groups goes down well. It means folks don’t have to self gather and manage, no one misses out and the barrier to entry is lowered due to the extent of “being told what to do”. Hooroo board room: Easy to sort out as we manage the room. A shared meeting room close by: If it requires a booking, best to get on it as soon as the Hack date is set. Main Hooroo showcase open area: Set up a whiteboard and a use few projector screens as walls and suddenly there’s a tidy little area for use. Hooroo quiet rooms: By opening up the doors of the 2 Hooroo quiet rooms and using a whiteboard on wheels to block off the area, you create a nice spot for a team to set up. 5) Share Hack details. This is fairly straightforward but requires a bit of prep. Essentially it’s a slide deck at our company Friday showcase that recaps last Hooroo Hack, reminds everyone why we do Hooroo Hack, what the next Hack theme is and details some timelines between that day and the Hack kick off. Create, print and put up some Hooroo Hack posters: Our design team are always a big help with this and love putting these posters together. It’s great to see them around the office advertising the upcoming Hooroo Hack teams, theme, dates etc. Send out a 9am “Hack kick off” calendar invite to get Day 1 of the Hack going. This is a great reminder for folks closer to the time and is also a timely chance to repeat the slides used at showcase. 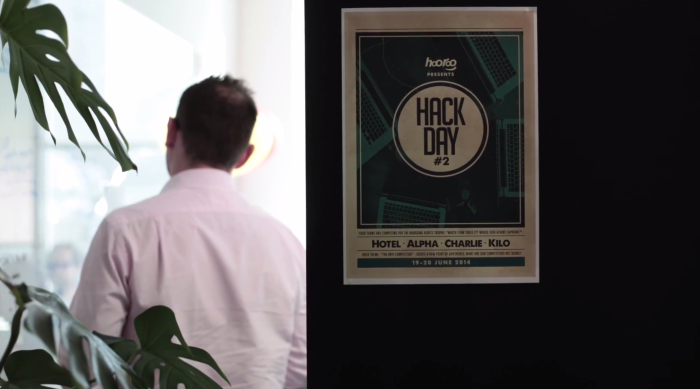 Set up a “Hack pitches & voting” calendar invite for the arvo of Day 2 of the Hack. This can also be shared with external folks who may like to attend the pitches and vote for a winner. 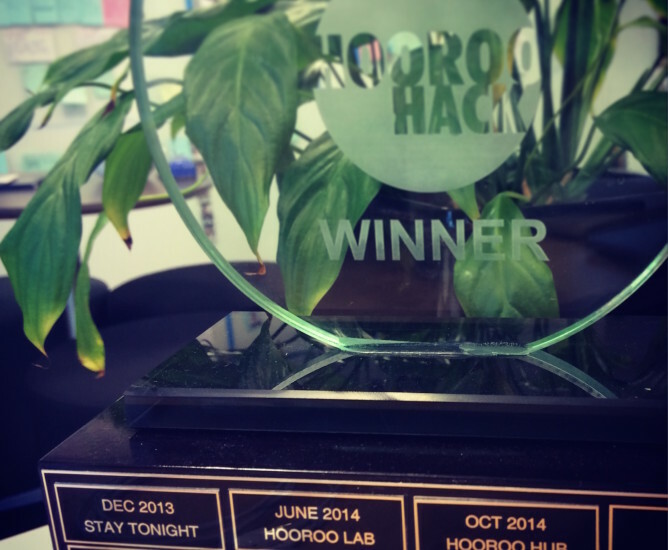 Send out a Hooroo Hack prize giving calendar invite to follow the preso’s and voting and book a nice space at a bar of your choosing. Decide on a voting method. Our voting boxes work a treat and someone usually brings in coloured poker chips so each team can be identified and can’t get away with voting for themselves. 6) Kick off the Hack. Pretty straight forward. After setting up the team areas first thing in the morning, get everyone together and get things going. Take a random draw to allocate teams to rooms and the order of pitches. Remind teams they need to put an A3 pitch poster together to be next to their voting box and that they need to be ready to present at the decided time the following day. 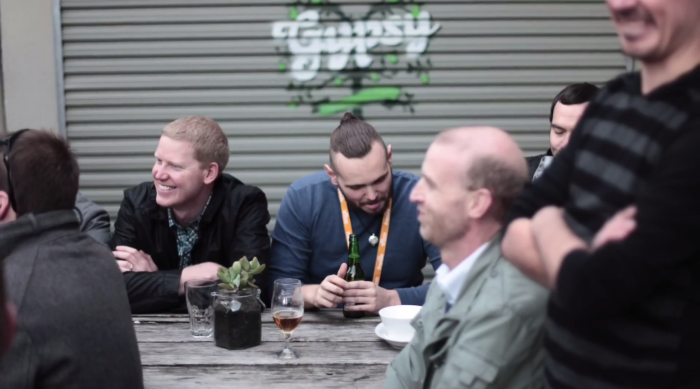 Recap how voting will work and where prize giving and drinks will happen in the arvo. 7) Hack. The best part! 8) Pitches. Set up the Hooroo Showcase area for the pitches. One team may have to finish early to help with this. Follow the order identified the previous day. 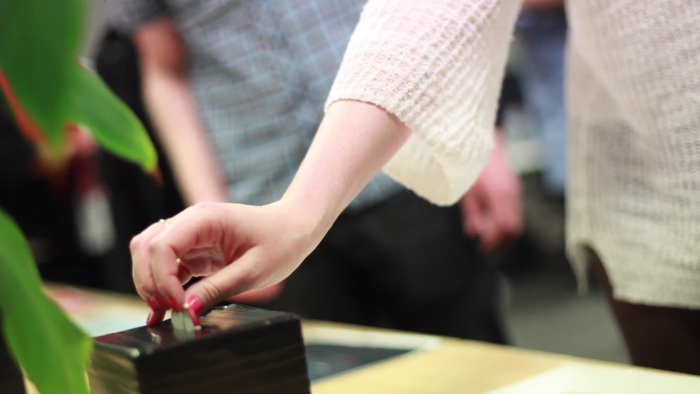 Hand voting tokens to team members after they have finished their pitches. 9) Voting. Have everyone vote and then help clean up their team areas before heading out to the pub. The rule of 2 votes per person and not voting for your own team has worked pretty well. 10) Count votes. Most votes wins. Make sure teams haven’t voted for themselves. Take notes of best pitch poster and best pitch for announcement at the pub later. 11) Head to the pub. Announce winners and give the trophy. 12) Get the trophy engraved. Usually takes about a week and costs $20. It’s great to capture the winning team’s idea and the date of month/year of the hack for posterity. 13) Collect feedback. A quick email in the week following Hack to make sure everyones ideas and suggestions are captured. 14) Start thinking about next Hack. Here’s a video from Hooroo Hack #2 back in June 2014. Excuse the audio track. Mike turned this around quick smart at the time and didn’t have many options. Here’s another video of outtakes where the folks at Hooroo give progress updates on how Hooroo Hack #3 is going for them and their teams.